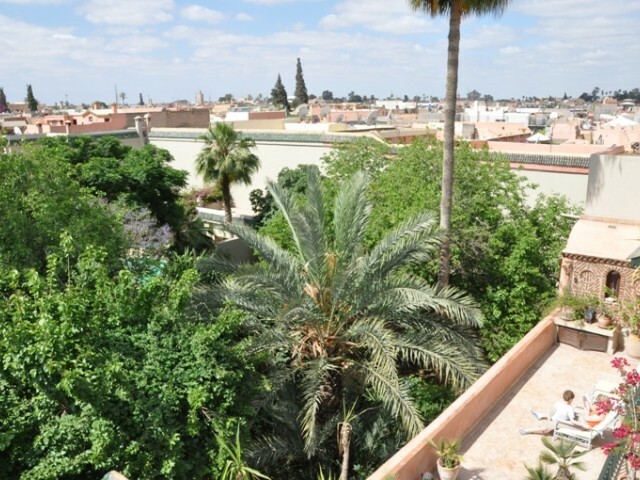 The suite is situated at the second floor, in the winter part of the palace, overlooking the large and exotic garden from the large andsunnyterrace. 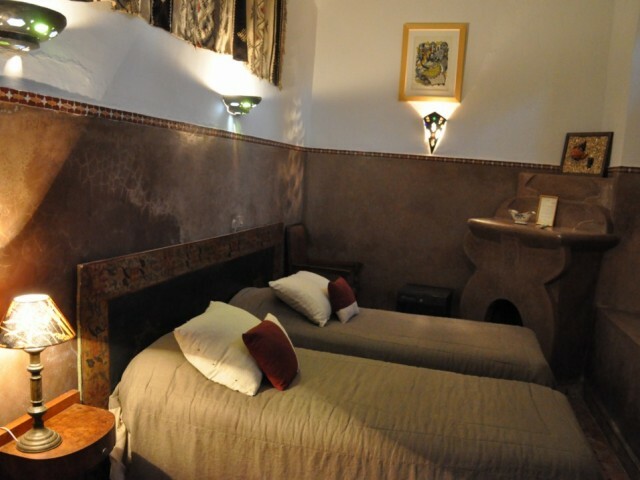 The bright and elegant bedroom , with Art Deco artefacts , white Tedllakt, is separated by a 30�s decorated bathroom, looking through another large and oriental ceder door to a cosy bedroom with ancient Meknespiece of furnitures. 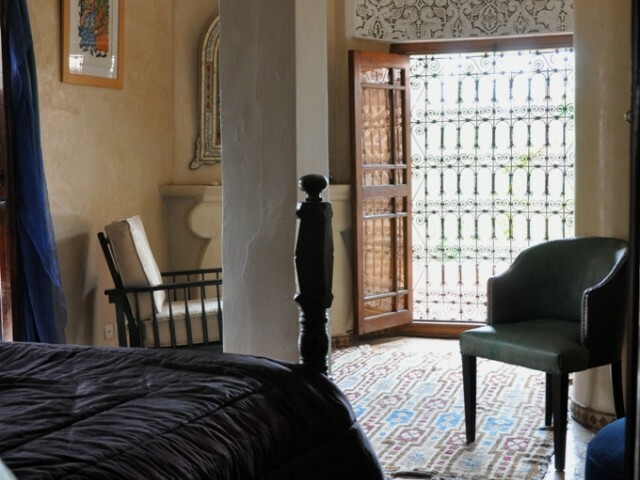 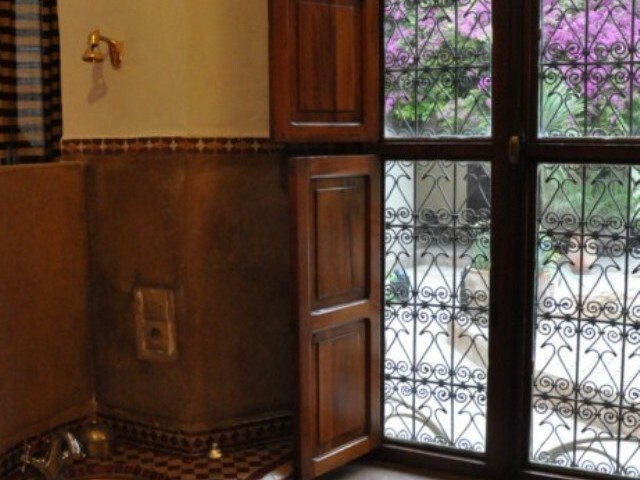 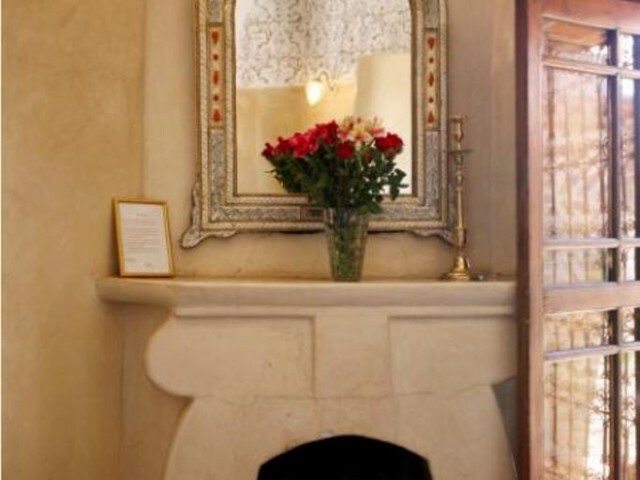 This lovingly restored room situated on a large terrace overlooking the garden with a four poster bed is very bright with its large iron gate window and with a view on the most sublime garden of the medina. 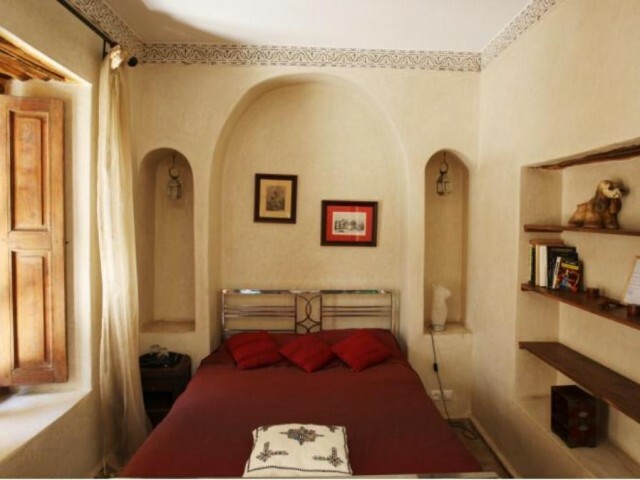 Its white vaulted bathroom its Art Deco piece of furniture is a mixing with oriental and occidental art. 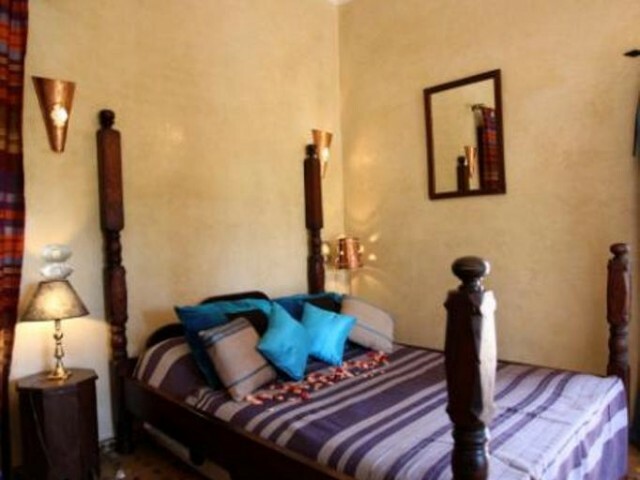 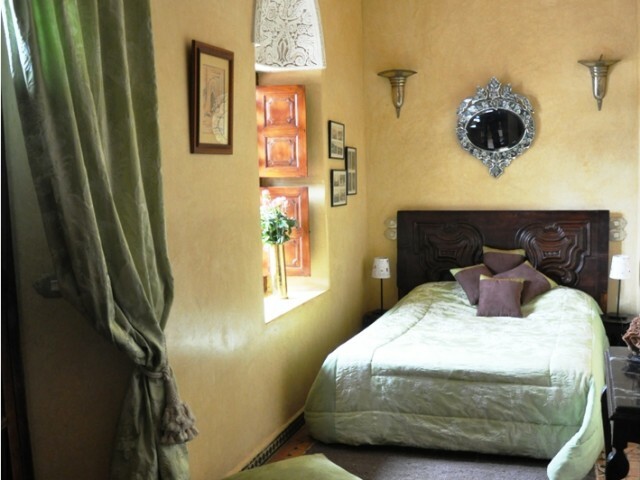 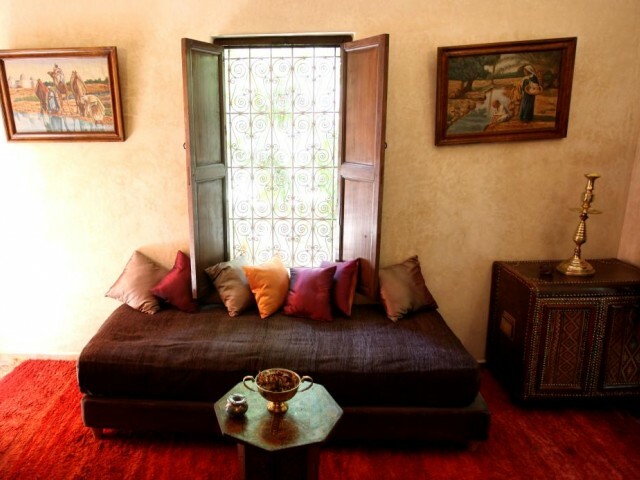 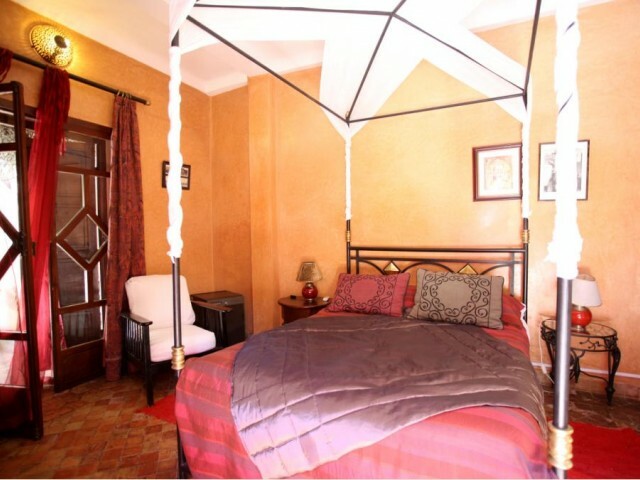 Lovingly bedroom with redtedllakt walls and a small sitting room at the entrance, with a single bed.Art deco decoration with Moroccan artefacts, with a direct view on the garden. 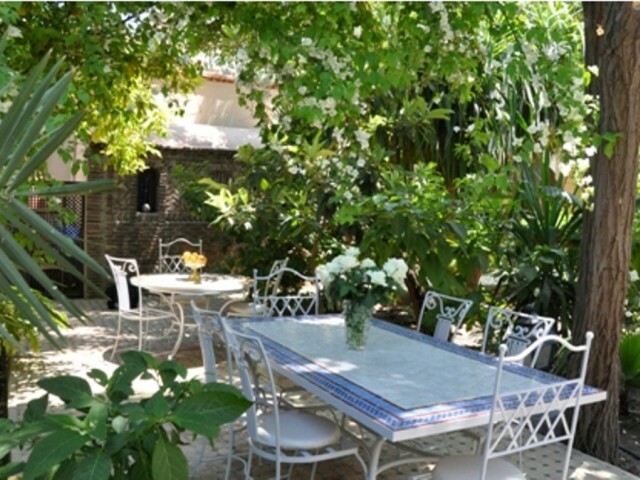 This room is closed to the swimming pool, covered by a wonderful bougainvillea, with an orange tedllakt colour diffussing an intimist ambiance. 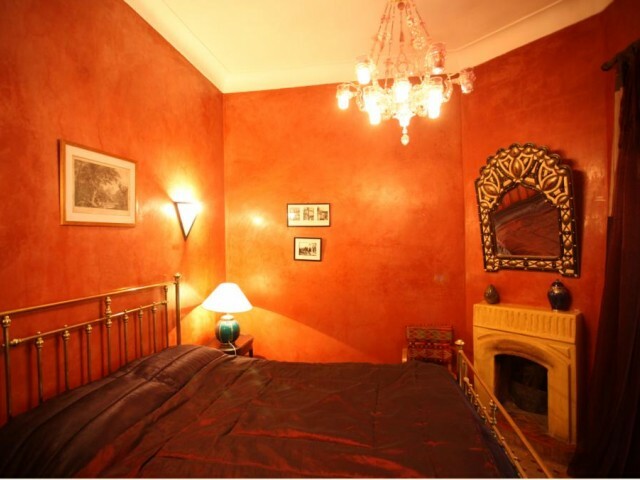 Iron bed and oriental decoration with old orientalist paintings. 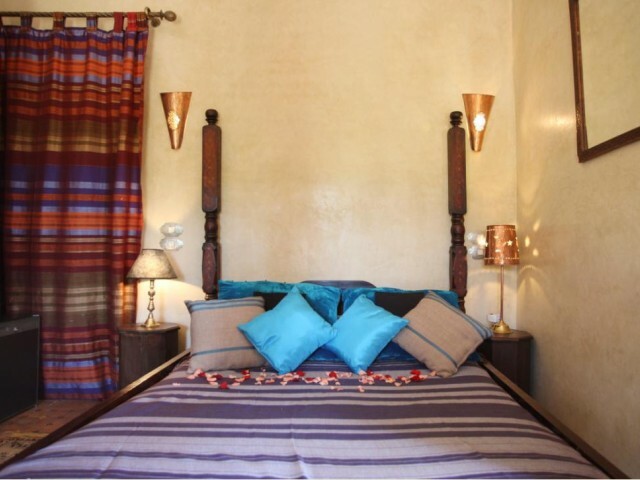 Cosy ambiance for this bedroom with brown chocolate tedllakt, the shower decorated with zelliges reminds your oriental journey. 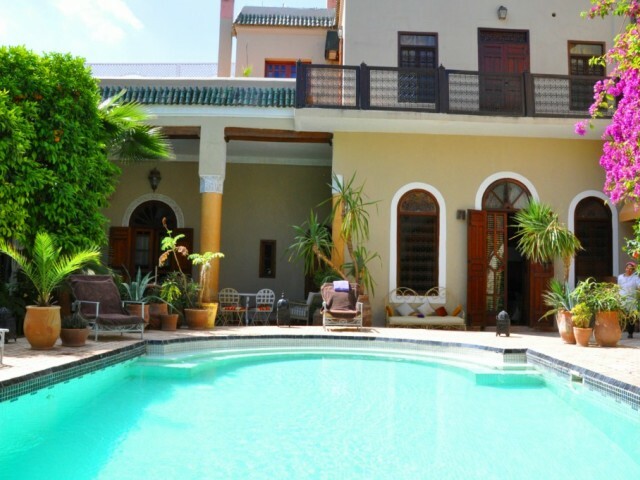 Direct view on the swimming pool and the exotic garden. 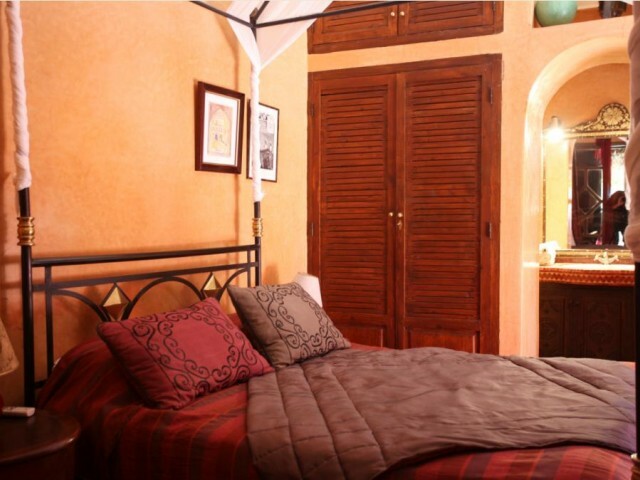 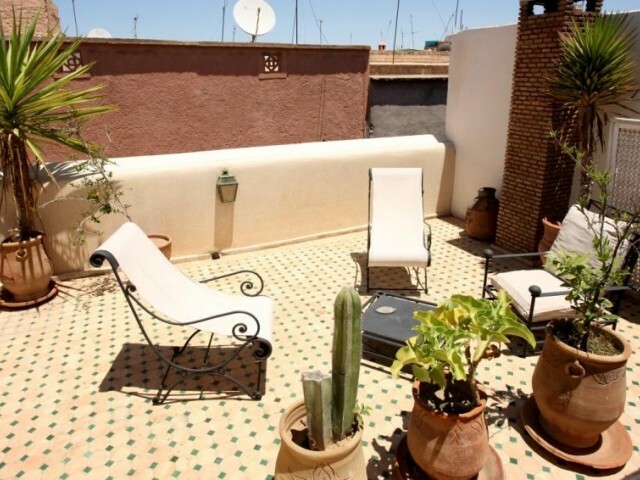 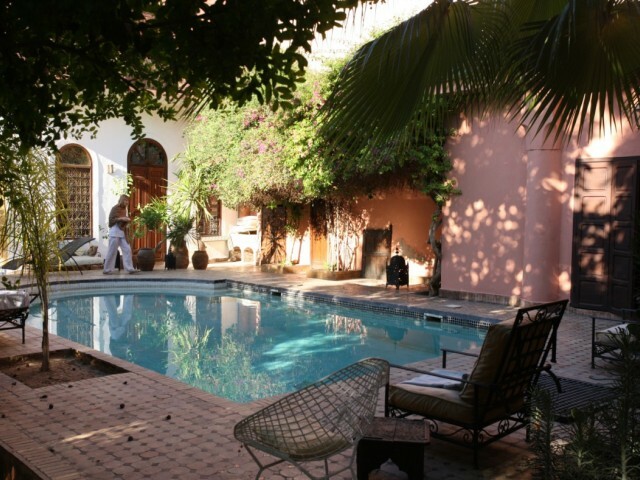 Dar Dreifa is an enchanting riad 30 meters from Riad Elarsat, in the same street, offering high quality accommodation with traditional decor. 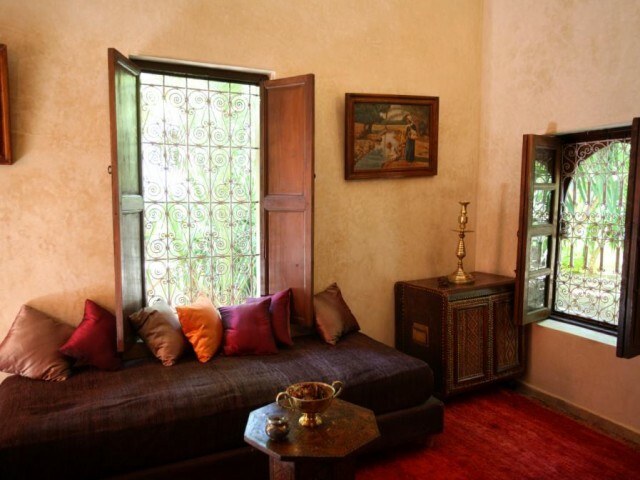 As it was originally, Dar Dreifa is built around a patio to admire the blue sky above.On the ground floor the ceilings are in greenish orange tatoui, invoking the freshness of an oasis, while the burnished sandy grey of the tadlakt (Moroccan polished plaster) softens the tones of the surfaces. 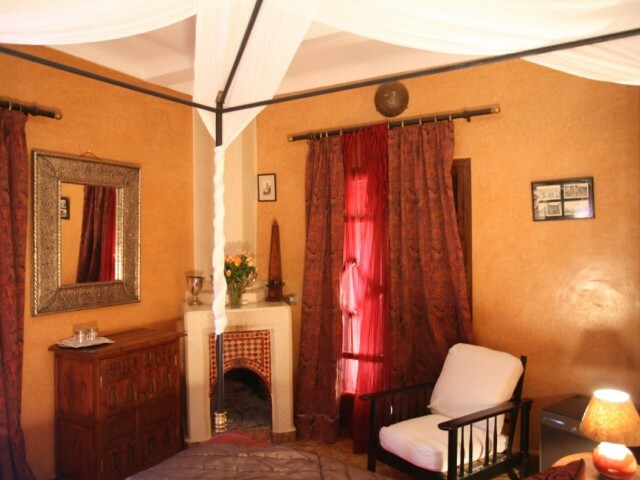 On the first floor there are two bedrooms opening onto a hall and the mezzanine floor, surrounded by wrought iron and with a cedar wood ceiling.On the second floor there is one bedroom with a terrace for relaxing and dozing.Staying at the Dar Dreifa means you have immediate access to the Riad Elarsat for breakfast, lunch and dinner, as well as access to the pool and the garden for 2 hours per day.Bedroom 1: A very cosy and intimate room with an ancient door separating the shower/bathroom - an oriental feeling. 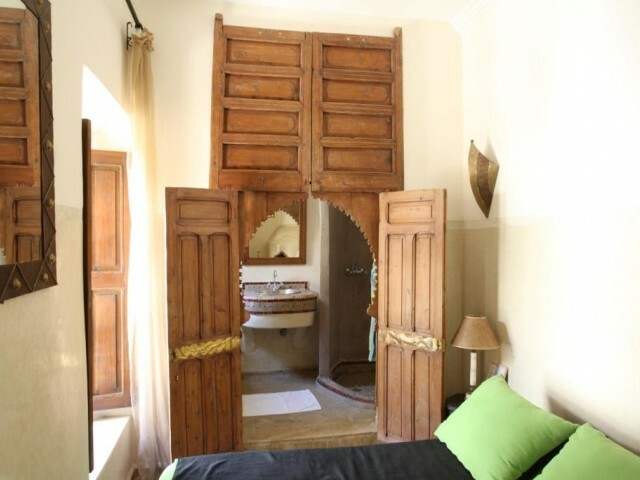 Dar Dreifa is an enchanting riad 30 meters from Riad Elarsat, in the same street, offering high quality accommodation with traditional decor. 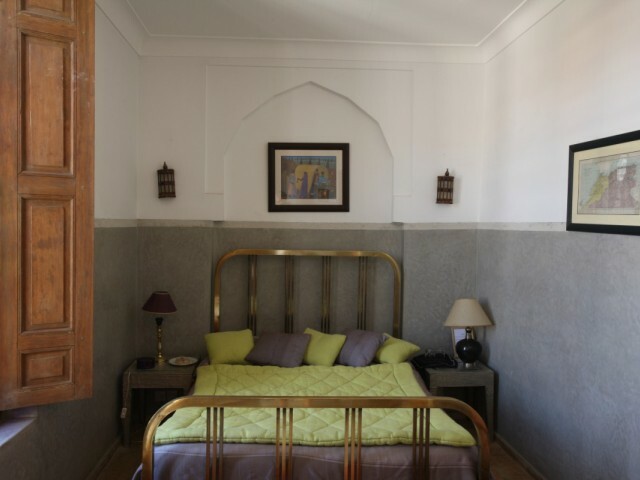 As it was originally, Dar Dreifa is built around a patio to admire the blue sky above.On the ground floor the ceilings are in greenish orange tatoui, invoking the freshness of an oasis, while the burnished sandy grey of the tadlakt (Moroccan polished plaster) softens the tones of the surfaces. 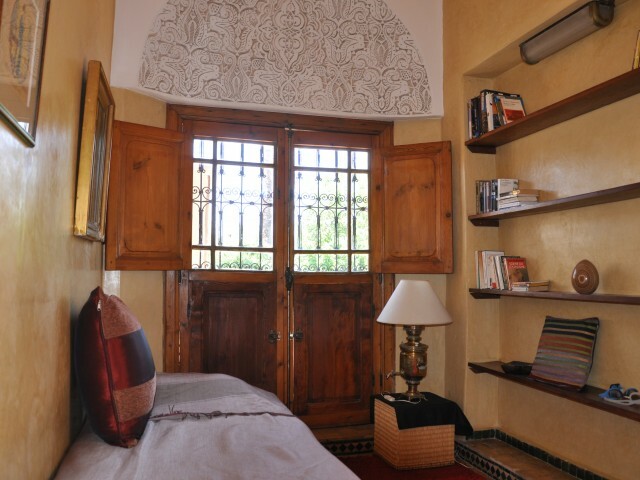 On the first floor there are two bedrooms opening onto a hall and the mezzanine floor, surrounded by wrought iron and with a cedar wood ceiling.On the second floor there is one bedroom with a terrace for relaxing and dozing.Staying at the Dar Dreifa means you have immediate access to the Riad Elarsat for breakfast, lunch and dinner, as well as access to the pool and the garden for 2 hours per day.Bedroom 2: A snug atmosphere in this room with its delicate decor and a very original shower room. 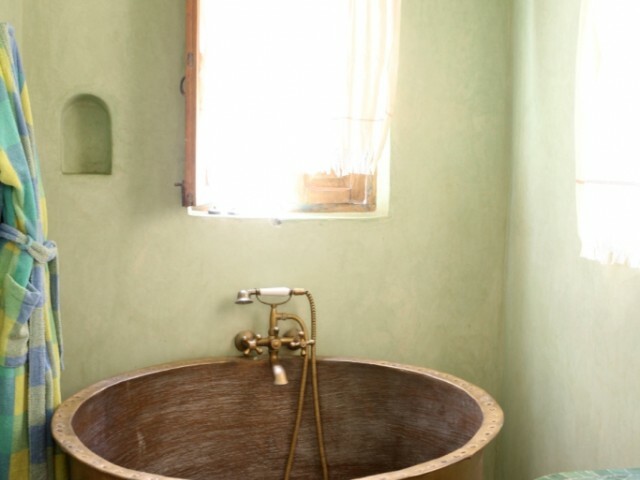 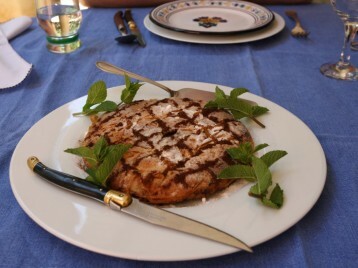 The tadlakt is pale green and is really charming.